These are some software since 1998 to 2003. I was still an undergraduate student back then, trying to make something out of my very limited capability. I stopped writing freewares since 2003, simply because I have no time. I got more important things in life that I need to take care about. 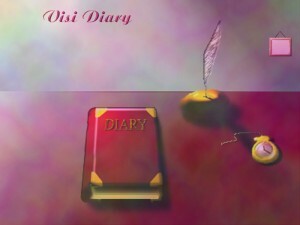 Visi Diary is a program to write, store and read personal diary. Data is encrypted and password protected, allowing people to write any private matters using this software. Last version published was version 4.0. It was equipped with a cute character as helper. We can “talk” to her to get help about certain features. VTL is an horoscope software based on astrology. It has two features: getting our “prediction of the day” and matchmaking score based on birth date. Last version published was version 2.5. I guess there will never be another update, sorry.